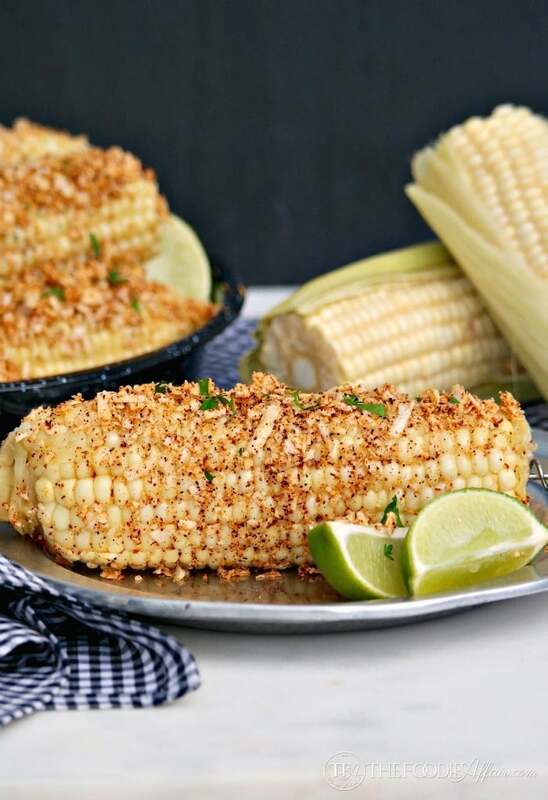 Mexican Style Corn on the Cob topped with plenty of melted butter, chili powder, cotija cheese, salt and fresh lime juice. Have you hit up your local or State Fair yet? We try to get to our local fair every year. It’s a small event, but we get a good turn out for the competitive exhibits and livestock auction. There is also plenty of ferris wheel and twirly rides that everyone seems to enjoy. What I really enjoy is the concession stands full of fried twinkies, funnel cakes (extra whipped cream, please! ), and one of the newest foods that has made its way to street fairs and county fairs is Mexican Style Corn on the Cob! 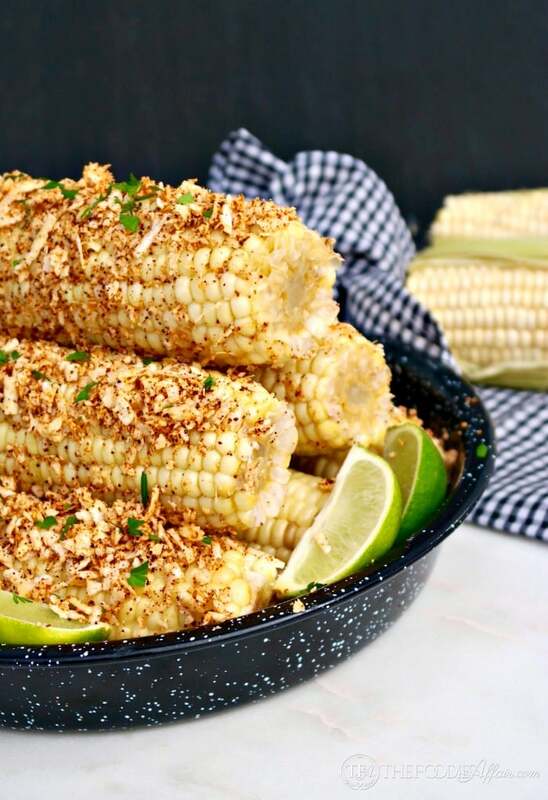 Fresh ears of corn are grilled on huge hot grills charing the corn perfectly, and then lathered in butter and a layer of El queso Cotija de Montaña, a salty dry cheese mixed with chili powder. The traditional recipe also includes either mayonnaise or creama. I don’t care for mayo, but if you do, do use it in this recipe. It’ll help glue all the goodies onto the corn. On the Stove - Over medium high heat bring a large stock pot of water to a boil. Place clean corn in the pot and cover bringing the corn back to a boil. Cook for 3-10 minutes according to your preference. Remove with tongs and let cool. To Grill - Remove a couple of layers of the husks and soak the corn in a large pot of water for 15 minutes. 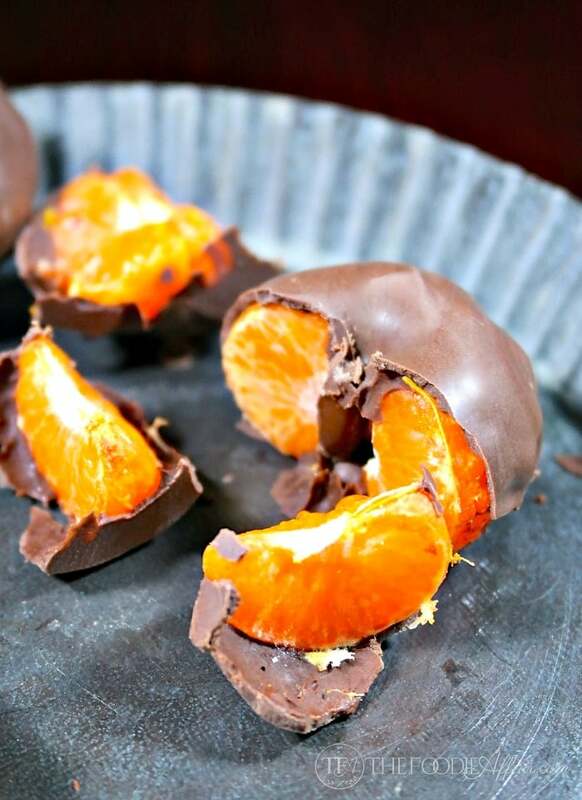 Pull down the husks to remove the silk, but keep a couple of layers intact. Over medium heat on oiled grates grill the corn turning them to char the whole corn. Place your corn on indirect heat (sides or a top grill) and cook for about 15 minutes. Remove with tongs and cool before handling. In a shallow bowl or dish mix cheese, chili and salt together. Coat corn with melted butter and then roll into cheese mix. Garnish with cilantro and serve with lime. 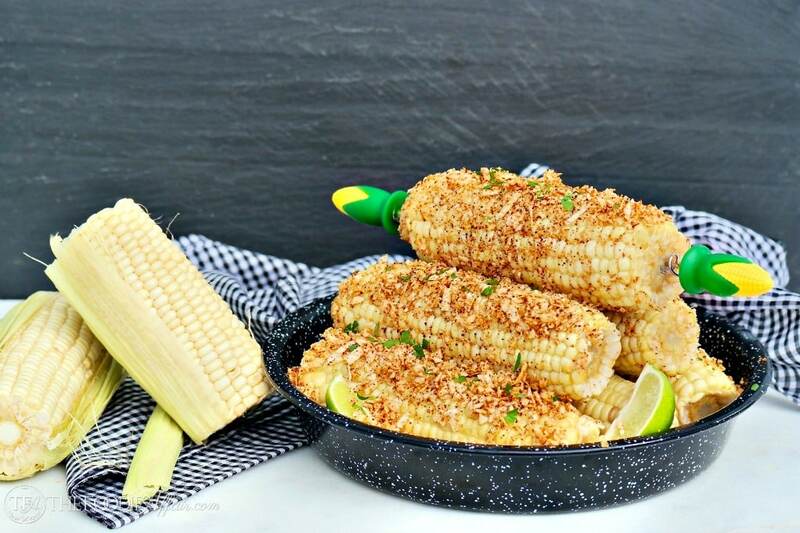 Squeeze lime over corn and enjoy! Now you can make this tasty corn at home year round! 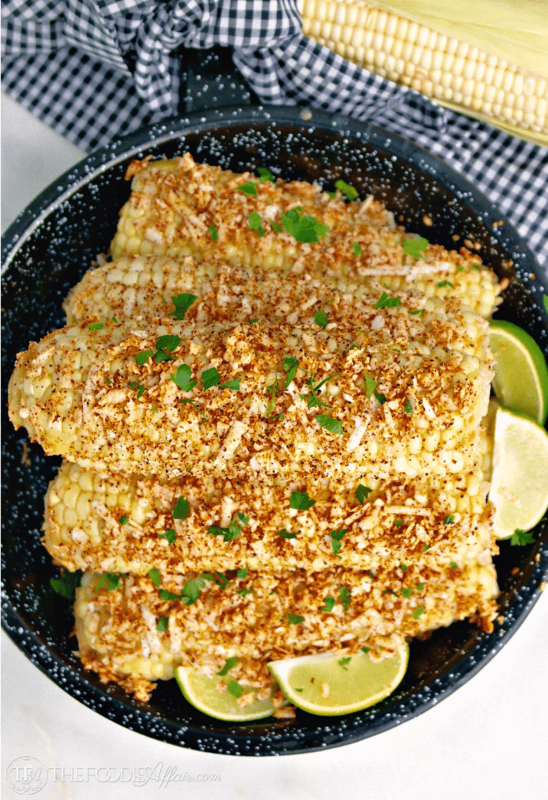 Grill your corn, cook it on the stove or you can also cook the corn in a Crock Pot like this Slow Cooker Corn on the Cob with Cilantro Lime Butter. Which ever method you try you’ll love the sweet corn with the salty cheese and flavorful chili. 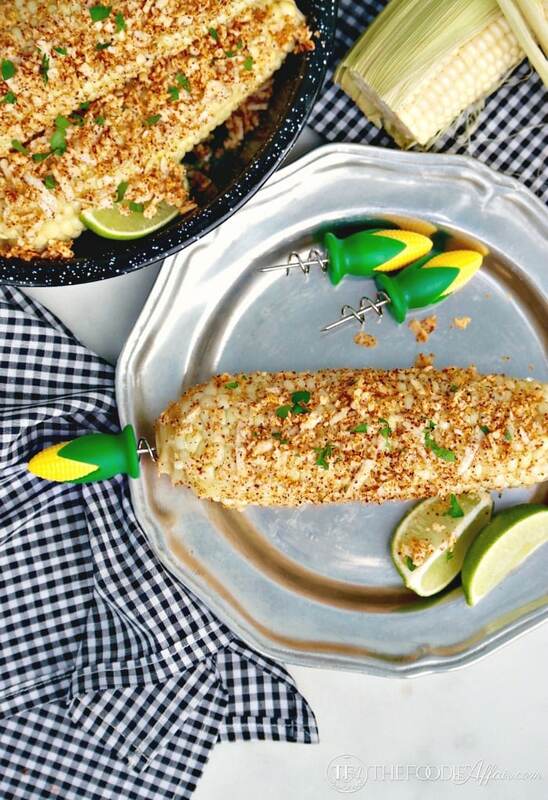 This Mexican Style Corn on the Cob is a meal on its own! Enjoy with a refreshing Paloma Cocktail! That sounds so good. I have never had corn like this, but can’t wait to try it. Oh, Robin you are in for a treat! The sweet and salty together in a savory dish is so darn good! These look SO good! I Love jazzing up my corn for the summer! It’s the best way to get my kids to enjoy it, too! That looks like an amazing corn dish. I think my kids would first say they wouldnt eat it but then dig right in. Sounds amazing for summer! I may have to try this! I hope you do! It’s a very easy corn on the cob dish! I love grilled corn. We are cooking out this weekend, I’ll have to add this to the menu. Yes, yes, yes! This is my kind of corn – looks so delicious. You’ll love this corn with these tasty toppings, Alice! Enjoy! Omg!!! !this corn looks amazing!!!!! I definitely need to give this a try!!! They have it with chili powder on it in India too!😗 Love it. 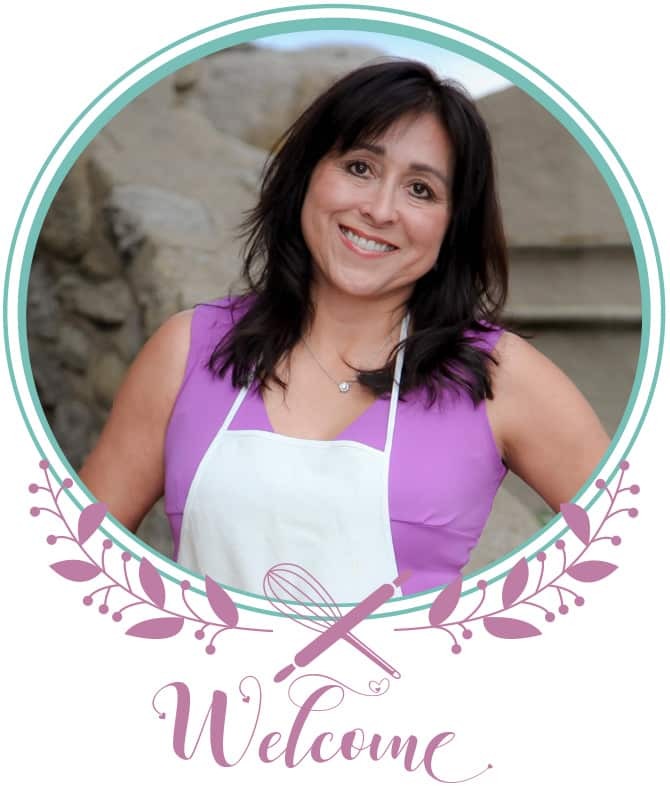 This is going to be the perfect Cinco de Mayo recipe! We are corn lovers and all these goodies on it sounds delicious! This is like comfort food to me! We used to get it from a little roadside stand in Hawaii and I miss it! One of my favorite treats for summer time. Will definitely be trying this at home soon!! The cotija cheese was so much better than any cheese Id tried to make these with before! The corn flew off our table and we all fought to have the two extra pieces! This is such an awesome side dish idea! I love mexican corn! I have never wanted to reach through a computer screen more than I do right now, looking at that delicious Mexican corn on the cob!! Holy smokes — my mouth is watering!